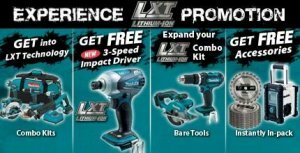 People like us don't usually need an excuse to buy new power tools, but Makita always makes it a little harder to resist the buying temptation by offering great tool promotions. Now until the end of this year you can get the brand new Makita 3-Speed Impact BTD144Z free after mail-in-redemption, when you purchase a qualifying cordless tool. Qualifying tools include: 5 3/8" Metal Cutting Saw BCS550, 7/8" SDS-PLUS Rotary Hammer Kit BHR240, 3/8" Angle Drill Kit BDA350, 1/2" High Torque Impact Wrench Kit BTW450, or Portable Band Saw Kit BPB180. If that wasn't enough for you, Makita is also giving away ten 15 piece 18-volt LXT lithium-ion combo kits. WOW! What a great prize one of these would be to win. This contest also ends at the end of this year, so be sure to enter today.